At this point, most gamers remember the infamous Phantom game console. In 2002, Infinium Labs promised to revolutionize gaming by eschewing physical discs, having its users download all of their games from the Virtual Phantom Game Network. Flash forward several years, and the Phantom became one of the game industry’s biggest pieces of vaporware. Infinium Labs promised the public they would be able to buy, demo and rent games from their network, as well as being able to chat with friends and play all their games online. Sounds pretty similar to OnLive, right? Unfortunately, the Phantom never saw the light of day and remains one of the industry’s most infamous pieces of vaporware. While many of the Phantom’s features were considered groundbreaking and innovative at the time, one piece was actually put into production – The Phantom Lapboard. I got to thinking about the Phantom a few weeks ago and went to the company’s website – www.phantom.net. From what I remember about the lapboard, Phantom Entertainment was promoting it for Internet TV users. Being an avid OnLive user, I was surprised what I saw — the company is now promoting the lapboard for use with OnLive. I just had to try this out, and a few days later, the Phantom lapboard arrived at my door. The lapboard comes in two color schemes: a white and black design that looks similar to the Phantom console’s original pattern and an all-black design. I received the all-black one, and as I unboxed it, I couldn’t help but notice how the shiny black finish of the casing looked exactly the same as the MicroConsole. Seeing the two side by side makes it seem like they were made for each other. The package includes a wireless, three-button mouse and a wireless, tilting keyboard that features a swivel plate that rotates 360-degrees to suit both left- and right-handed users. The keyboard tilts up at an angle, revealing a rather large surface area underneath where the mouse rests, thus allowing you to place the entire peripheral on your lap. Overall, the lapboard feels well made, but it would have been nice to see some added buttons on the mouse, similar to many gaming mice available today. After I loaded the AA batteries in the keyboard and mouse and put in the 2.4 GHz USB dongle into the MicroConsole, I was ready to go. While there’s a driver disc included in the box, there was no need for any set up at all; it worked immediately with the OnLive MicroConsole, which was very nice. At first, the mouse acted a little finicky. The cursor jumped around a bit, and it seemed like I was outside of the mouse’s range. My couch is seated about 12 feet from my TV, so I moved up a few more feet, and it worked a lot better. 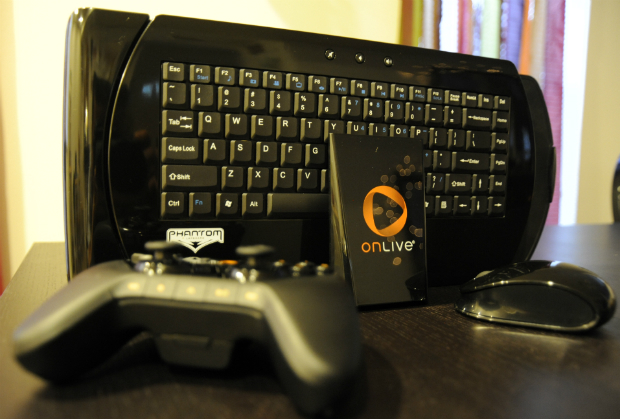 I have to say that The Phantom Lapboard works really well with OnLive. I was a bit worried that having the keyboard resting on your lap while simultaneously using the mouse would cause the lapboard to move around too much, but that wasn’t the case at all. The keyboard is very sturdy, and when you want to put it away, you press a rubber button on the side of the keyboard, and the clamshell lapboard collapses into one piece that easily fits in your entertainment center. The thing I love the most about the lapboard is that it opens up the entire OnLive library for me. I can now sit on my couch and comfortably enjoy The Witcher or Divinity II. 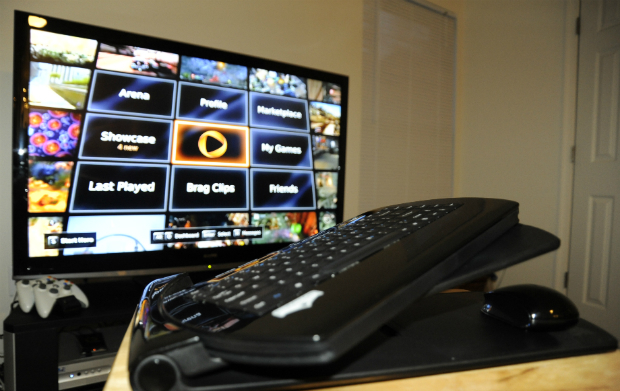 I definitely give my stamp of approval, and if you’re like me and do the majority of your OnLive gaming from your couch, the lapboard is a must have. 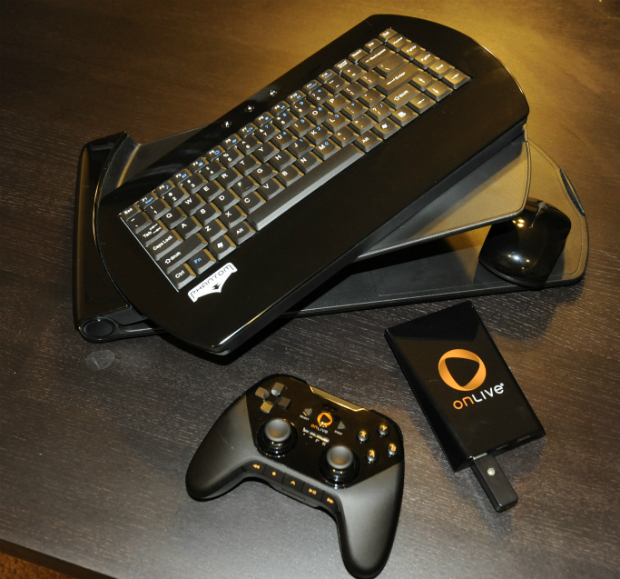 Owning the lapboard is going to make even more sense when OnLive finally releases its web browser. It would be great if OnLive partnered with Phantom Entertainment to package the lapboard along with the MicroConsole and OnLive controller because it really completes the entire experience. Currently, Phantom Entertainment is offering the lapboard for $99 as a special promotion exclusively for OnLive Fans, which is about a $30 discount from the lapboard’s normal retail price. All you have to do to get in on this deal is to go to www.phantom.net/onlive_promo and enter “promo” for the username and “onlivefansrock” for the password.